To judge the 2011 BIPP awards everyones photographs had to be submitted a week before the ceremony to give the judges reivew the submissions which concluded with a full day of debate about the elements with in the photographs to ensure that they demonstrate technical excellence, expert lighting skills, story telling and a flare for creativity. I waited with a large group of my peers as we listened to the judges deliver a critique of our images, they awarded merits and then presented the winners in each category. The judging started well for me as I won merits in all the categories that I entered. Resulting in 6 merits in total by the end of the evening in the commercial, fashion and portraiture categories. It was then announced that was the Illustrative Photographer of the year because of the story telling in the photograph, followed by an even more pleasingly result as I won the Fashion photographer of the year. This then left me very nervous as we waited for the announcement of the main award. The overall winner was judged from the winners of each of the 8 categories This was an award that I had seen Steve Howdel and Alan Stone win and wanted to achieve that same accolade. It was then announced and the Commercial photographer of the year was…Richard Mayfield, I had done it and very proud that all my hard work from learning my craft over the years had paid off. Thank you to everyone who has and will continue to inspire me as I continue on this exciting journey. The Annual Print Competition attracted just under 200 entries and an appreciative audience at The Owl on April 20th to hear judges Denise Swanson and Russell Baston critique all entries and see the winner’s trophies and merit certificates awarded. 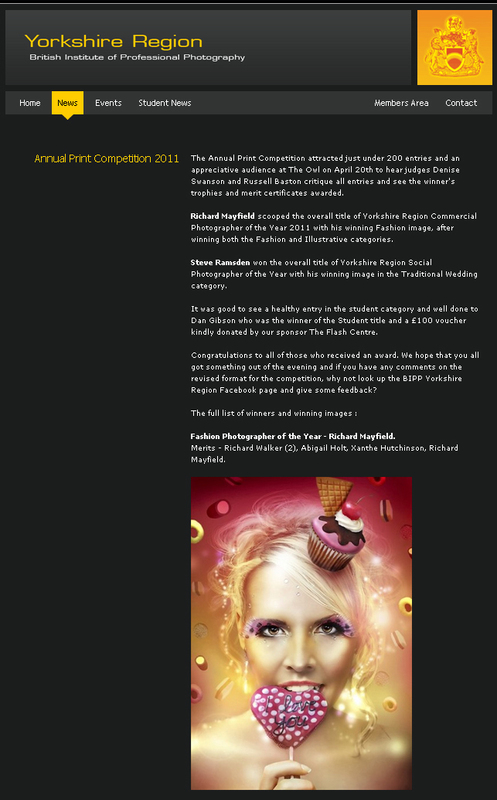 Richard Mayfield scooped the overall title of Yorkshire Region Commercial Photographer of the Year 2011 with his winning Fashion image, after winning both the Fashion and Illustrative categories. Steve Ramsden won the overall title of Yorkshire Region Social Photographer of the Year with his winning image in the Traditional Wedding category. It was good to see a healthy entry in the student category and well done to Dan Gibson who was the winner of the Student title and a £100 voucher kindly donated by our sponsor The Flash Centre. Congratulations to all of those who received an award. We hope that you all got something out of the evening and if you have any comments on the revised format for the competition, why not look up the BIPP Yorkshire Region Facebook page and give some feedback?